If you're looking for a great (and cheap!) hotel in Miami Beach, CheapTickets is the best place to find them. We offer deals on the best 448 hotels throughout Miami Beach. No matter what you're looking for, we have options for you. Grab great rates on the 220 affordable 3-star hotels that are easy on the wallet without sacrificing comfort. Looking for more luxury? Try one of the 107, 4-star hotel accommodations in Miami Beach. No matter your budget needs, we've pulled out all the stops to make sure you have plenty of vacation options. Maybe you prefer to search for your hotel deals based on what each hotel offers? For example, let's say you just want to find a hotel or resort that has a pool to cool off in after a long day exploring Miami Beach. 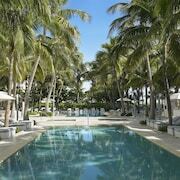 Scroll down to choose from the 184 hotels in Miami Beach that has a pool for guests. Or search for deals on Miami Beach hotels offering free wifi or breakfast, non-smoking rooms, and more! CheapTickets is here to be your personal travel agent for your next trip to Miami Beach. Get booking today! What hotels in Miami Beach offer free wifi access? Are there deals on Miami Beach hotels offering free breakfast? Yes! The only thing better than finding a great deal on a cheap hotel in Miami Beach is finding one that offers free breakfast. Grab some eggs, a waffle, or some healthy oatmeal before a day full of exploring Miami Beach and all that it has to offer. Below are just some of the many hotels that offer free breakfast in Miami Beach. Best Western Plus Atlantic Beach Resort is a 3.00 star rated hotel property in Miami Beach that offers free breakfast. The Whitelaw Hotel- a South Beach Group Hotel is a 3.00 star rated hotel property in Miami Beach that offers free breakfast. 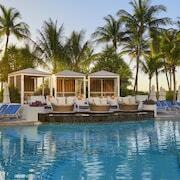 Miami Beach Resort is a 3.50 star rated hotel property in Miami Beach that offers free breakfast. The Clay Hotel is a 3.00 star rated hotel property in Miami Beach that offers free breakfast. What about deals on pet-friendly hotels in Miami Beach? Miami Beach is a great place to get outside and explore with your pets in tow so don't leave your furry friends behind. Below you'll find great deals on hotels in Miami Beach that allow pets. Don't forget to bring plenty of treats! Catalina Hotel & Beach Club- a South Beach Group Hotel is a popular, pet-friendly, 3.50 star hotel in Miami Beach. 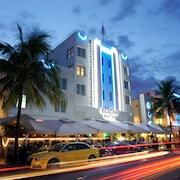 Chesterfield Hotel & Suites- a South Beach Group Hotel is a popular, pet-friendly, 3.00 star hotel in Miami Beach. 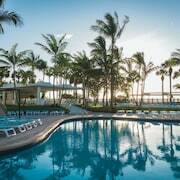 Royal Palm South Beach Miami- a Tribute Portfolio Resort is a popular, pet-friendly, 4.50 star hotel in Miami Beach. 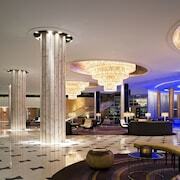 Mondrian South Beach is a popular, pet-friendly, 4.50 star hotel in Miami Beach. Any good rates on Miami Beach hotels with restaurants? Absolutely. Don't want to deal with planning our all your meals on your trip to Miami Beach? We don't blame you. Keep the hangry away by staying in one of the 140 hotels that have restaurants. With a room at one of these spots, all it takes to get a good meal is hopping in the elevator. Check out some of the most popular hotels in Miami Beach that have restaurants below. Book Shelborne South BeachShelborne South Beach is a 4.50 star hotel and has one or more restaurant options. Book Dorchester HotelDorchester Hotel is a 3.00 star hotel and has one or more restaurant options. Book Congress Suites at the StrandCongress Suites at the Strand is a 3.50 star hotel and has one or more restaurant options. Book Nautilus- a SIXTY HotelNautilus- a SIXTY Hotel is a 4.50 star hotel and has one or more restaurant options. What are the cheapest hotels in Miami Beach with pools? What's better after a long day exploring Miami Beach then a relaxing dip in a pool? Finding the Miami Beach hotel you need for a bargain! Cool off and unwind at one of our 184 Miami Beach hotels with a pool. Browse some of the top deals on these hotels and resorts with pools in Miami Beach below, but be warned: You may not want to check out! Beacon Hotel South Beach has a pool and a 4.00 star rating. Gale South Beach has a pool and a 4.50 star rating. The Hall South Beach has a pool and a 3.50 star rating. Shore Club has a pool and a 4.00 star rating. What hotels in Miami Beach offer parking for guests? Once you've made your way to Miami Beach, the last thing you want to deal with is finding parking close to your hotel. Avoid the hassle of parking around the block and carrying your luggage all the way to the lobby by booking one of our hotels with parking. Check out deals on some of the 200 hotels in Miami Beach that offer parking for guests. The Savoy Hotel & Beach Club This hotel has a 3.50-star rating. SLS Hotel South Beach This hotel has a 4.00-star rating. Clevelander Hotel - Adults Only This hotel has a 3.50-star rating. The Hotel of South Beach This hotel has a 4.00-star rating. Do Miami Beach hotels offer 24-hour concierge services? When you're on vacation, things don't always go according to plan. Travel with peace of mind when you book one of our 157 hotels in Miami Beach with 24-hour concierge service. That way you know help is always phone call or elevator ride away. Try Richmond Oceanfront Hotel. It's a 3.50 star rated hotel in Miami Beach that offers concierge services 24 hours a day. Try The Hotel of South Beach. It's a 4.00 star rated hotel in Miami Beach that offers concierge services 24 hours a day. Try Riviera Suites South Beach- a South Beach Group Hotel. It's a 4.00 star rated hotel in Miami Beach that offers concierge services 24 hours a day. Try Eden Roc Resort Miami Beach. It's a 4.50 star rated hotel in Miami Beach that offers concierge services 24 hours a day. What about low rates on non-smoking hotels in Miami Beach? Red South Beach This hotel has a 3.50-star rating. Grand Beach Hotel This hotel has a 4.00-star rating. Room Mate Lord Balfour This hotel has a 4.00-star rating. The Confidante - in the Unbound Collection by Hyatt This hotel has a 4.50-star rating. What are the cheapest Miami Beach 3-star hotel deals? Our 3-star hotels bring you quality accommodations at a lower price point for the perfect, budget-friendly vacation in Miami Beach. With 220 3-star hotels throughout Miami Beach to choose from, you still have options. Browse our selection below. Miami Beach Resort. Located in a less populated stretch of mid-Miami Beach, this resort faces the Atlantic Ocean on one side and the Intracoastal Waterway on the other; glitzy South Beach is 3 miles away. Catalina Hotel & Beach Club- a South Beach Group Hotel. This retro-style South Beach hotel is 1 block from the boardwalk and ocean, 1 block from the Lincoln Road pedestrian mall and the convention center, and 2 blocks from the historic Art Deco District. The Deauville Beach Resort. 5 miles north of South Beach nightlife and Lincoln Road shops, this convention resort in the middle section of Miami Beach faces the ocean; the adjacent white-sand beach stretches 700 feet. Clevelander Hotel - Adults Only. This beachfront property is located in Miami Beach, close to Lummus Park Beach and Flamingo Park. Other nearby points of interest include Port of Miami. 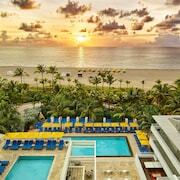 What are the best deals on 4-Star Hotels in Miami Beach? Miami Beach is full of hotels and it can be hard to narrow down where you really want to stay. Luckily, we've done that hard work for you be narrowing you from 448 hotels throughout Miami Beach, to the 107 4-star hotels in Miami Beach. Our 4-star hotels in Miami Beach are exactly what you need for your next family trip, romantic weekend, or solo getaway. Check out our most popular deals below. Fontainebleau Miami Beach: This famous Miami Beach hotel rises above 1,000 feet of Atlantic Ocean beach, just 2 miles from shopping on Lincoln Road and 3 miles from Miami's South Beach. Loews Miami Beach Hotel - South Beach: This beachfront Miami hotel blends the Art Deco charm of a historic St Moritz hotel with a modern 18-story tower, and is 3 blocks from Lincoln Road, and 0.3 miles (0.5 kilometers) from the Fillmore Miami. Royal Palm South Beach Miami- a Tribute Portfolio Resort: Located in South Beach, this beachfront hotel is on the boardwalk and within a 15-minute walk of Anchor Shops, Lincoln Road Mall, and Art Deco Welcome Center. Lummus Park Beach is 0.7 mi (1.1 km) away. Dream South Beach: This family-friendly Miami Beach hotel is located on the Strip, within a 5-minute walk of Miami Beach Cinematheque and Art Deco Welcome Center. Lummus Park Beach and Lincoln Road Mall are also within 1 mi (2 km). What are the most popular attractions in Miami Beach? People travel to Miami Beach from all around to witness the incredible sights and attractions. With 6 sights to see during your stay, you're sure to have a busy trip in Miami Beach. Below, we've listed some of our favorites. I didn’t like the long wait to check in, but I understand the policy states 3:00pm. Broken light, broken faucet, light out in closet. I loved everything, this place was simply amazing! The hotel was great. The rooftop pool was really nice. People should be aware of parking though. It can be tough. Also no microwaves are present, so be aware of that.